CHICAGO (WLS) -- A West Side basketball coach paralyzed in a shooting is getting a new future. Morgan Stanley Iinvestment bank is hosting an event to raise money for Shawn Harrington's new bionic exoskeleton in the South Loop Wednesday night. Harrington was shot twice in 2014 while dropping his daughter off at school. 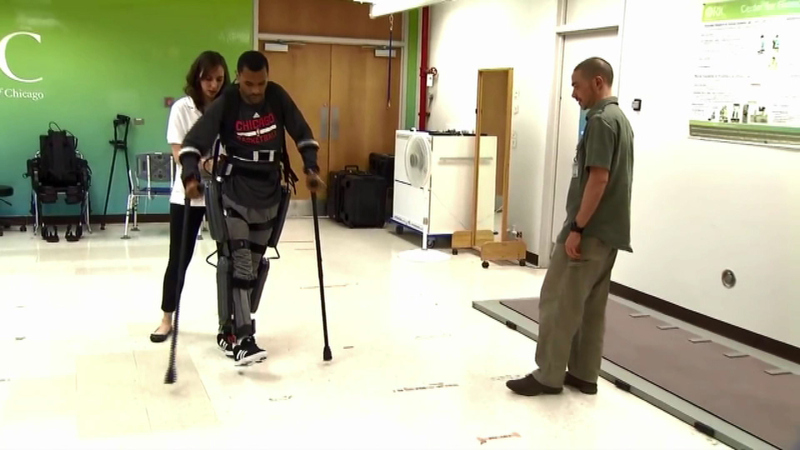 The 39-year-old tried the exoskeleton technology at the Rehabilitation Institute of Chicago. "I know 5'11" is not that tall, but once I stood up I was taller than everyone in that room," Harrington said of the technology. "It was just one of those moments that I will never forget, standing up for the first time." Harrington is also being honored with this year's Giant Steps award for his inspirational recovery and his work to stop violence in Chicago.